Relive the days when video equipment made clunking noises. 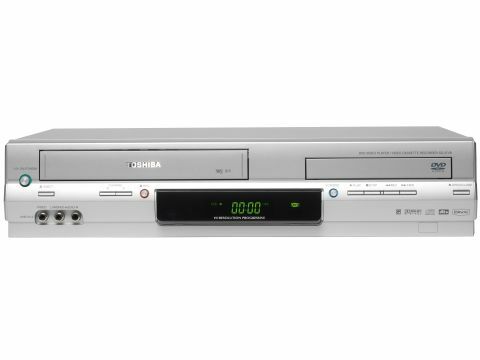 It's a bit surprising to see a DVD/ VCR combi that doesn't include DVD recording features - there aren't many of these beasts around and it is something of a nostalgia trip to look at a unit where the VCR is the sole recording platform. Still, the price more than reflects this and the design of the deck is quite nice, given the constraints placed on all such combis. Connectivity is basic but covers the important bases. At the front there are very basic inputs, just composite video and stereo audio. There really isn't any need for anything more because the VCR would not be able to do anything with a DV or S-video input anyway. At the back there are component video outputs, capable of serving a progressive scan signal up to a suitable TV. HDMI outputs are growing in popularity, but this is strictly a budget machine and has no use for such techno wizardry. There are two Scarts, one for connecting an external source, such as a digibox, and one for hooking up to a TV. The output Scart can issue an RGB feed but the input Scart is not RGB-capable - again, there's no point with just a VCR to record on. Digital audio can be routed out via the electrical output, and there are stereo backups. Features are the usual offerings for both formats. The DVD player can handle DivX, MP3 and JPEG fi les, and there is a VOD code that helps you register the player for movie rental downloads. There is a zoom (up to 3x normal size), slow-motion (as slow as oneseventh normal speed) and repeat play options. The DVD section also has an Enhanced Black Level (EBL) function that boosts the black level of a picture, which is something you'll need to try before deciding whether you like it or not. The VCR can record in SP or LP modes, the latter doubling tape capacity to squeeze eight hours of programming on to a four-hour tape. This is one of the few areas where VHS can still stand toe-to-toe with DVD. Many DVD recorders cannot capture as good an image in six or eight-hour mode as a VCR can in LP. The timer is manual and can be set to record weekly, every day, every weekday, weekends or just about any other combination. There is a PDC (Programme Delivery Control) function, but no VideoPlus, and it's bizarre to see such old technology actually take a step backwards. NTSC tapes are happily played and you can even switch to LP recording while an SP recording is in action, in case a programme you are watching and simultaneously recording overruns and you're afraid the tape is about to run out. There are two setup menus to go through, but things could hardly be easier. The remote (a very nice design, by the way) is well laid out and the options for setup are very familiar by now. The VCR menu is a real step back in time. A blue screen with big, blocky white lettering is straight out of the '80s. Personally, we love it, but it's probably a matter of taste. There's just one operational foible to warn you about - the Open/Close button on the remote opens the DVD tray regardless of whether you are using the DVD or the VCR at the time. To eject a VHS tape you have to get off your comfy sofa and press a button on the machine itself. We'll deal with the DVD player first. This offers a really good image via an RGB Scart connection, delivering vibrant colours without any distracting artefacts. Our test film, Monsters, Inc, looks extremely inviting. Sometimes it looks as though you could step into the screen, the colours are so deep. Real-life action is also well handled, but the impact isn't quite as great. Skin tones are a touch overdone, but otherwise the dynamic colour is enjoyable. Trick-play functions work smoothly and the remote is very responsive. You can even zoom in while in slo-mo playback. Multimedia playback really impresses. Our tricky DivX file was handled without a bat of the eyelid. There were absolutely no lip-sync issues, which this disc causes on many decks, and the video was smooth as silk, with a bit more detail than we're used to seeing. On to the VCR, and the results are also good, but within the limitations of the format. It's a long time since we at What Video regarded VCRs as high-quality recording platforms, so the Tosh is bound to struggle when compared to qualitatively different digital recorders. In SP mode the picture retains a good amount of detail, looking much like a four-hour DVD recording, but without the artefacts. Motion remains smooth, but there is an edge around sharply defined objects and an overall softness. Colours remain accurate - there is no unpleasant garishness, and this holds true for skin tones as well. Switching to LP mode much of the detail takes a hike but the picture is still watchable. Onscreen text becomes indistinct and details dissolve in the middle distance, but it is worth repeating that this is better than long recording modes on many DVD recorders, which introduce masses of artefacts and, often, a strobe effect as well.